The Connaught Fund is an internal program that provides an opportunity for tri-campus U of T researchers to receive funds to further their work, with some funds earmarked specifically for young researchers as they begin their careers. This year, 12 U of T Scarborough faculty members received New Researcher Awards from the U of T Connaught Fund. The fund awarded 56 U of T researchers across all three campuses a total of $994,000. U of T Scarborough researchers won $239,880—nearly a quarter of the total funding. 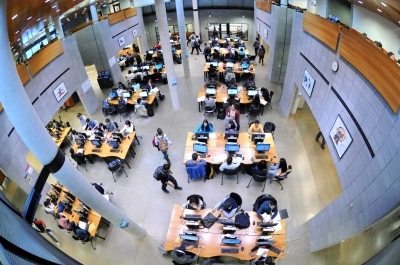 Applicants at U of T Scarborough had a success rate of more than 92 per cent. The Connaught Fund is an internal program that provides an opportunity for tri-campus U of T researchers to receive funds to further their work, with some funds earmarked specifically for young researchers as they begin their careers. From finding groundbreaking ways to address health risks to uniting sides in textbook debates, the U of T Scarborough studies range across seven disciplines and 12 unique topics. Department of Management - Incentives for complex transactions - bridging economics and ethics. Is it ethical to pay people for genetic material, such as human organs or eggs? This question has been debated for decades by economists, who argue that people have the right to make their own decisions, and ethicists, who argue that people may not know enough about these transactions to give informed consent. Sandro Ambuehl is working to bridge these schools of thought. Ambuehl is studying how incentives, such as money, influence people’s research and resulting decisions to do things they know little about—like organ donation. In his previous study, An Offer You Can’t Refuse, Ambuehl found that the more money women were offered to sell their eggs, the more likely they were to ignore the risks of donating. In this study, he is trying to find if someone’s intelligence, more specifically, their ability to inform themselves, makes this effect even stronger. Department of Anthropology (Health Studies Program) - Maternal diabetes and perinatal mental illness: a population-based study. Hilary Brown is studying the intersection of diabetes, pregnancy and mental health. She is looking at women who have Type I and Type II diabetes, their risks of developing depression and anxiety during pregnancy, and one year after pregnancy. Brown will examine healthcare records of Ontario residents from the Institute for Clinical Evaluative Studies. If Brown finds a relationship, it would mean women with Type I and II diabetes would require better resources to protect their mental health during pregnancy and to determine if they have mental health markers or conditions earlier in pregnancy. “This work is an important component of considering how one’s health before pregnancy could impact wellbeing during and after pregnancy, so that better support can be provided,” says Brown. Department of Human Geography - Financializing forests in British Columbia: Land, governance and the ecological fix. While living in British Columbia and researching the reforestation industry, Mike Ekers saw nearly one-third of Vancouver Island purchased by businesses interested in private forestlands and widespread public opposition. The land was first purchased by Brookfield Asset Management, which closed several saw mills, and was later sold to two pension plans. Right before Brookfield’s original purchase, the B.C. government largely deregulated what happened on private land, which prompted the investment. The now-private property is also unceded Indigenous land. Ekers is conducting interviews with key informants and researching and examining policies, government organizations and legal documents connected with the financial investments in forests and the deregulation of land. He is looking at Indigenous land claims and private property, who benefits from resources on private property, how private property changes with financial ownership, and the effect on environmental standards and local employment. Department of Psychology - Can emotion regulation counteract the harmful effects of stress exposure? The role of reappraisal in protecting individual's emotional and physiological outcome. Brett Ford is studying how people can protect themselves against the harmful influences of stress. Stress can worsen both mental and physical health, from stronger symptoms of depression to higher blood pressure. In 2014, over 6.5 million Canadians said that most of their days were moderately to severely stressful, according to Statistics Canada. But not everyone who lives with chronic stress experiences its negative effects—Ford says this means there must be a way to protect ourselves from it. Indicators of stressful situations include negative emotions, such as sadness, anger or fear. Ford says the ability to manage these emotions should protect against the mental and physical cost of stress. In her research, Ford is looking to determine how we can intervene or prevent the negative health influences of stress before they begin to manifest. Department of Management - Exploring barriers of small and medium-sized enterprises (SMEs) to international market access through e-commerce. For small and medium-sized enterprises (SME’s) in developing economies, entering the international market is considered a crucial way to grow. But very few of these organizations ever get there. Most literature says this is because these organizations do not have the entrepreneurial abilities or access to technology that they need to flourish. says these businesses are completely capable, they just do not have the reputation or exposure to foreign markets to enter them. Pamela Medina Quispe is working with “Peruvian SME’s to the World,” a two-stage program that works to help SME’s enter the international market. The first stage is to train organizations on entering foreign markets, the second is to randomly select other businesses and give them subsidies to promote and spread their business. Medina Quispe will then not only test each theory, she will also create an innovative new tool to track mass amounts of data online. The new software will digitally track e-commerce. Department of Arts, Culture and Media - App studies: Exploring the political economy of mobile media platforms. The applicaton (app) economy emerged during David Nieborg’s post-doctoral years. He noticed that while it is easy to create an app, it is increasingly difficult to advertise and profit from it. For the past four years, he has been examining the changing nature of this economy, and is now looking at the role of massive platforms like Google, Facebook and Apple. “I hope that this could be the beginning of a policy discussion or wider discussion on what is means to make or produce cultural content in the age of these very powerful platforms,” he says. Nieborg will be researching app stores, analyzing financial documents and interviewing app developers, with a focus on the online gaming and advertising industries. He is looking to find what it means to work with these platforms, and how dependence on monopoly corporations is changing the political economy of apps. This economy, he says, appears to be accessible, but is rapidly requiring a more complex understanding of its changing system—and a lot of money. Department of Computer & Mathematical Sciences - Ergodic theory of low-dimensional dynamical systems. The world is full of complex phenomena that are hard to predict, such as the weather or stock market. To try to understand them, scientists express the laws of nature as mathematical models. But even with an exact knowledge of the laws of nature, it is still impossible to predict what will happen in the world. Any minor errors in measurement can have huge impacts on the calculations in the long run. To analyze these systems, mathematicians work with dynamical systems, which simplify events into models. These models are created using probability theory. Systems are given a number, called entropy, to determine how chaotic they are. Giulio Tiozzo applies probability theory to describe the behavior of unpredictable events. Tiozzo’s research focuses on the family of quadratic polynomials. He studies how the entropy of a system changes as the rules of the model change. Stefanos Aretakis of the Department of Computer & Mathematical Sciences - Mathematical problems in general relativity. Andrea Charise of the Department of Anthropology - Novel remedies: Literature, health and the creative recovery of the humanities. Diana Xuan Fu of the Department of Political Science - Reaching for half the sky: Explaining China's new wave feminist movement. Mariana Khapko of the Department of Management - Markets of tomorrow: Blockchain trade settlement and liquidity. Stefan Renckens of the Department of Political Science - Transnational private sustainability governance as interest community.